Approximately 40% of patients with chronic idiopathic urticaria have antibodies to the alpha subunit of the high-affinity IgE receptor (FcεR1). In the patients, the cause of urticaria is not external; it is an autoimmune reaction. Patients with autoantibodies could be identified by histamine release assay, autologous serum skin tests and Western blot. 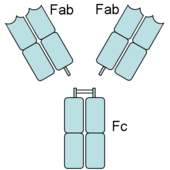 An antibody has Fab (fragment, antigen-binding) and Fc (fragment, crystalizable) regions. Fc receptors bind to the Fc region. Image source: Wikipedia, public domain. 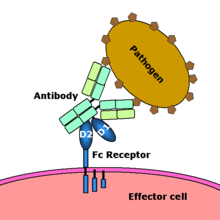 Fc receptor interaction with an antibody-coated microbial pathogen. Image source: Wikipedia, public domain. Anti-FceR1 autoantibodies in chronic autoimmune urticaria: IgG against FceRI (receptor for IgE) (click to enlarge the image). CD203c is a basophil activation marker known to be upregulated by cross-linking of the Fc (epsilon) RI alpha receptor and may serve as a useful marker to identify these patients. CD203 is expressed specifically on basophils, mast cells and their CD34+ progenitor cells and is upregulated by cross-linking of the FcεR1. Sera from patients with chronic urticaria significantly upregulate basophil CD203c expression as measured by flow cytometry. Activated basophils from whole blood are identified by flow cytometry on the basis of the presence of CD203c on high-expressing IgE positive cells. CD203c expression correlates with basophil histamine release and the size of the autologous serum skin test. Test code: IGERAB (it can be ordered through the Mayo Clinic lab service). Reference Lab: Sent to National Jewish via Mayo Clinic. Test description: Anti-Fce Receptor Assay. More info: Anti-IgE Receptor I antibody, anti-CD203c, Chronic urticaria assay. Reference range: greater than 2%, or by report. Specimen Required: Draw blood in a plain, red-top tube (serum gel tube is not acceptable). Allow blood to clot and separate within one hour. Send 1 mL of serum frozen. Transport requirements: Sera should be shipped frozen and received in the laboratory within 24 hours after drawing. Days test is performed: Mondays. Turn around time: 1 week. Chronic urticaria sera increase basophile CD203c expression. Yasnowsky KM, Dreskin SC, Efaw B, Schoen D, Vedanthan PK, Alam R, Harbeck RJ. J Allergy Clin Immunol 2006;117:1430-4. Clinical Reference Laboratories at National Jewish info sheet (PDF). Clinical Reference Laboratories at National Jewish - 2007 newsletter (PDF). Anti-IgE Receptor Antibody - Mayo Clinic test catalog. 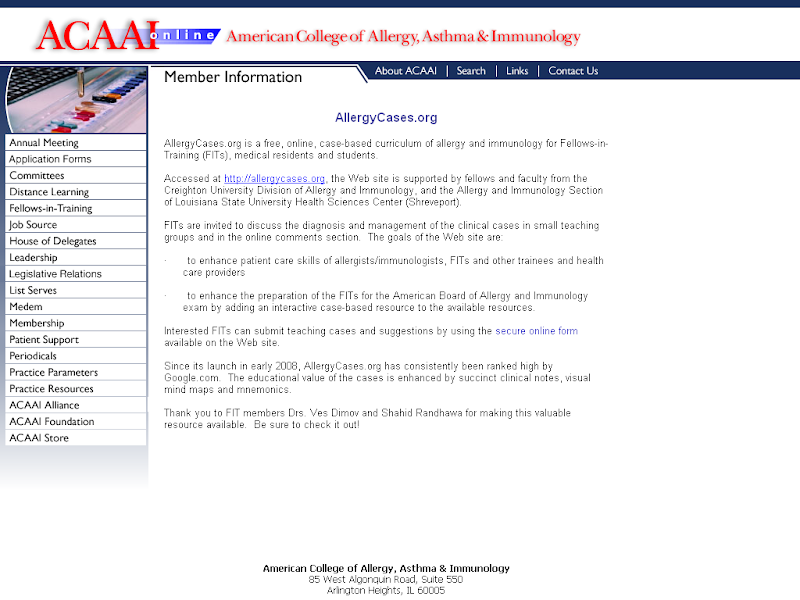 Tests for "autoimmune" urticaria - AAAAI Ask the Expert, 2011. All rights reserved, Dimov 2005-2018, email: allergycases@gmail.com. Powered by Blogger.